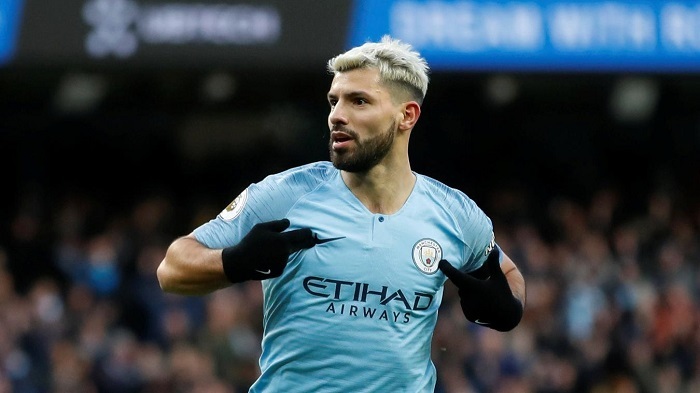 Aguero soon made amends with a thunderous 25-yard drive after great work from Oleksandr Zinchenko, and he then capitalised on Ross Barkley’s abysmal header to become City’s record league goal-scorer. Aguero’s header from Kevin De Bruyne’s cross crashed against the crossbar, but the Argentina attacker was able to celebrate his historic treble in the 56th minute. Sterling’s pace and skill drew a clumsy Cesar Azpilicueta foul inside the box, and Aguero beat Kepa once more with an excellent penalty. Goal difference might yet decide the title, and in thrashing Chelsea, City gave themselves an ever larger advantage over Liverpool. For the Blues, this was their fourth consecutive loss away from home in all competitions, with the aggregate score in their most recent three Premier League trips reading 12-0. What Barkley was thinking when he headed the ball back towards his own goal from 20 yards out is difficult to understand. Chelsea already trailed 2-0, but setting up Aguero’s second of the game ended any hope of a Blues fightback. Barkley looked out of his depth throughout and was unsurprisingly hooked early in the second half.